Promise rings have been around for a surprisingly long time. The earliest examples of promise ring first surfacing in 17th century England. The promise rings can come in many different styles. There is no convention on which – if any – precious stones are used. Some are even engraved with poetry or other phrases on the subject of love. In the US, we’ve been giving promise rings for as long as high school kids have been giving class rings to each other. 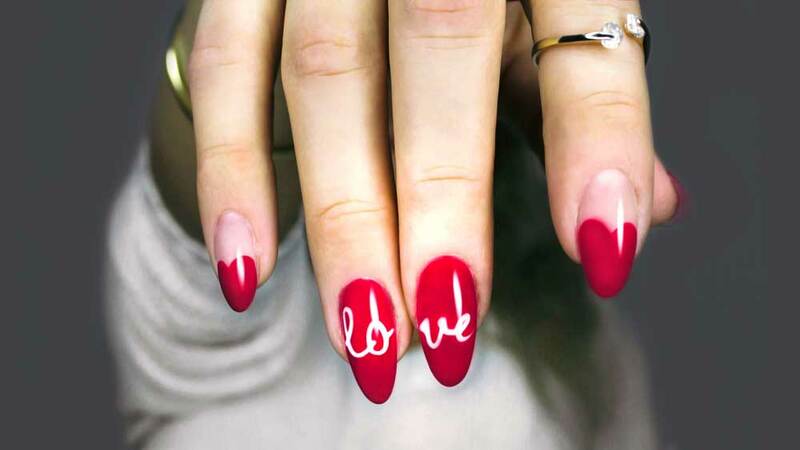 These gestures signify a blossoming and committed relationship, showing that love transcends money. There’s really nothing complicated about a Promise Ring. A Promise Ring is given as a commitment between two people to get engaged, and later on, marry. 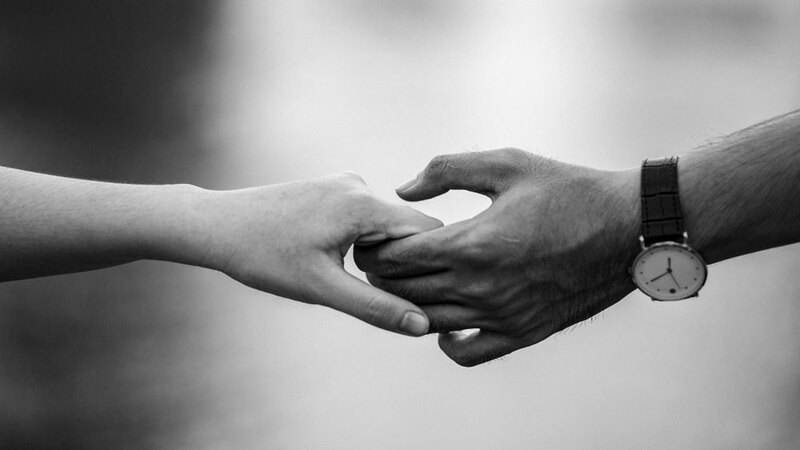 When given, it’s an indication that the giver is willing to commit to the relationship. The acceptance of the ring is an acknowledgment that the feelings are mutual. It is important to note that a Promise Ring is not an Engagement Ring! The actual jewelry used could be identical, but the meaning behind the rings are not the same at all. The Promise Ring allows a commitment to be made without the pressure that comes with an engagement. It helps show that the future of the relationship is secure. It may also be that the two people in the relationship don’t see marriage as a necessary formality. They may be happy for the commitment to be finalized without the pomp and ceremony – and cost! – of a wedding. The only condition of a Promise Ring is that it must actually promise something! Typically the Promise Ring will be cheaper than the cost of the Engagement Ring. Keep reading to find out more. There’s no real etiquette or rules around giving a promise ring. It isn’t a proposal. It doesn’t necessarily signify a new period in the relationship, and so it can be given when it’s comfortable to do so. A romantic dinner is nice, but watching TV or during a walk in the park is just as appropriate. It’s also not necessary for the giver to place the ring on the recipient’s finger as, again, we’re not talking about a wedding proposal. Of course, if a finger is offered, then there’s no harm in putting the ring on it. Surprising her and bending down on one knee is probably a bad idea as she may assume that you are proposing. Although the two have become connected in recent years, a Purity Ring is not a Promise Rings. They get mixed up all the time even though that have very little in common. Both rings indicate a commitment, but the types of commitment they represent are entirely different. A Purity Ring is a promise to remain pure until marriage. It is a commitment between the couple to engage in abstinence until marriage. The ring serves as a reminder to the couple as they struggle to keep strong to their commitment. A Promise Ring, as mentioned above, it a promise to remain faithful to each other. The Promise Ring doesn’t really have anything to do with purity and abstinence among each other. In the same way that all Jacuzzis are hot tubs, but not all hot tubs are Jacuzzis. All Purity Rings are Promise Rings, but not all Promise Rings are Purity Rings. Which Hand to Wear the Promise Ring? 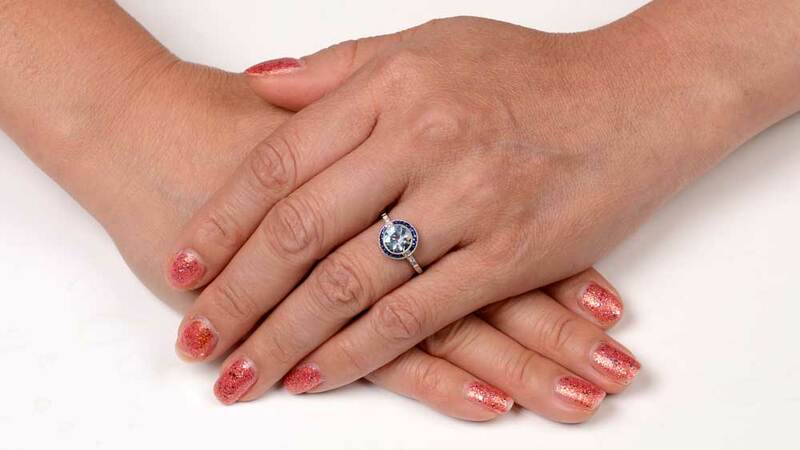 Promise Rings have been traditionally worn on the ring finger on the right hand. In the past 20 or 30 years, many people have started to wear the ring on the left hand in lieu of an engagement ring. When an engagement ring is received, the Promise Ring will then be moved to the right hand or taken off entirely. The point, though, is that it really doesn’t matter. A Promise Ring can be worn on any finger, on a chain around the neck or even on a toe. There literally are no rules for how and where Promise Rings should be worn. The significance behind the giving of the ring is far more important than where it appears on the body. As mentioned in the introduction to this article, Promise Rings come in all shapes and sizes. Early versions would have inscriptions on them of poems or bible verses. Later came lavish precious stone arrangements to bring a personal message to the recipient. It’s unusual to have a plain ring, although examples do exist which have Celtic or other cultural patterns engraved onto it. Today’s designs tend to straddle both ends of the genre somewhat, with small gemstones ring becoming more common, but usually in a more modest presentation than would be seen in an engagement or eternity ring. (Most Popular Option) A smaller Diamond Ring. The budget usually will range from 1/4 or 1/10 of the price of how much you plan to spend on the actual engagement ring. 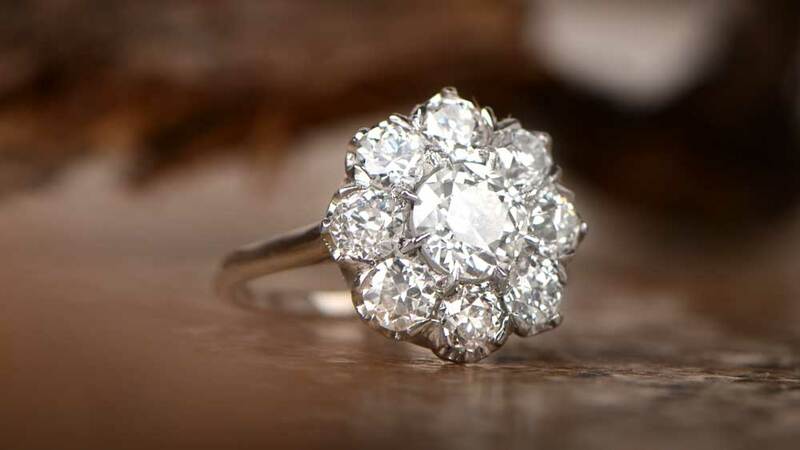 Due to the smaller design, many promise rings will be surrounded by a halo of diamonds. An Aquamarine Ring. Aquamarine has become extremely popular (especially after Meghan Markle’s famous Aquamarine Ring). Click here to view our collection of Aquamarine Rings. 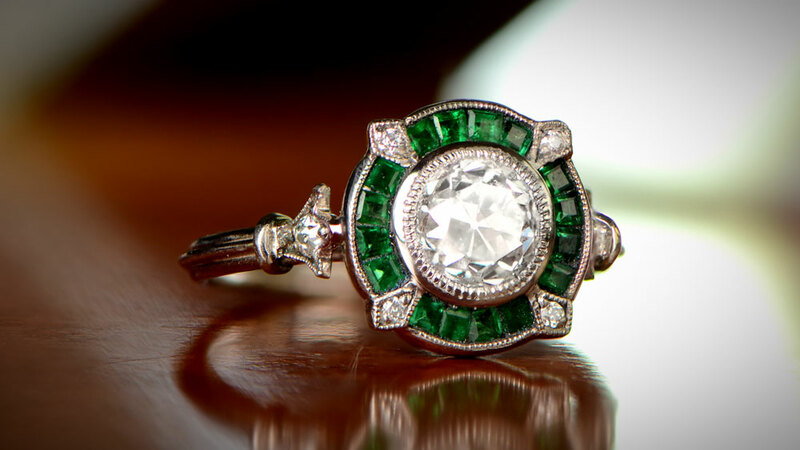 A precious stone set into a ring. For example Sapphire, Emerald, or Ruby. Any of the semi-precious stones set into a ring. For example Amethyst, Topaz, or Peridot. A Cubic Zirconia Ring. Basically a fake version of a real engagement ring. (A Growing Trend!) Her birthstone set into a ring. Click this link to shop our birthstone collection. How much does a Promise Ring Cost? This common question is probably the hardest one to answer. Our best answer would be: It depends. There are so many things to think about when setting a budget for the promise ring. You should never put yourself in financial jeopardy to purchase your Promise Ring. Also, it is important to keep in mind that you will also have to buy an engagement ring. 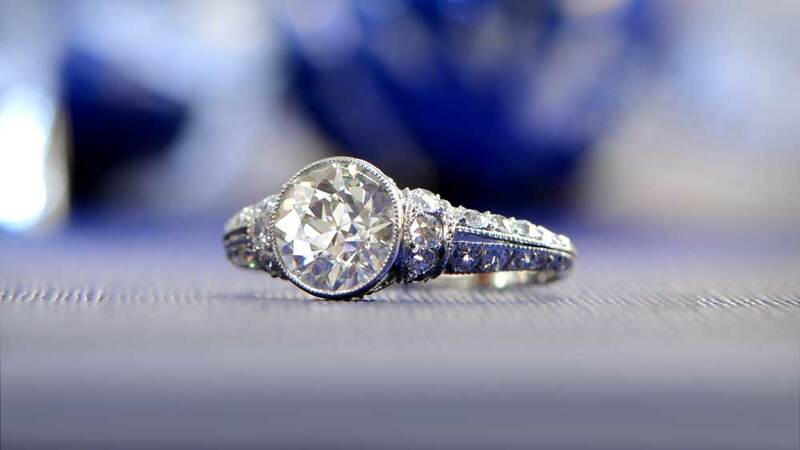 To learn more about how much to pay for your engagement ring, click here. As much as you can afford. If you can afford to pay $50,000 on a promise ring then why not just do it? The average going rate for promise rings runs between $100 – $4,000. If you purchase the ring for anything in that wide price bracket you should be fine. As little as possible if you are saving up for your engagement ring. So Should You Give A Promise Ring? Giving a Promise Ring is one of the most personal things you can ever do, and your reasons for giving it should also be personal. The convention is set aside and giving a Promise Ring – and all the circumstances surrounding it – are dictated only by your feelings and intentions. In short, if it’s right for you, then go ahead and do it. Click here to shop Engagement Rings and click here to shop for Gemstone Rings.